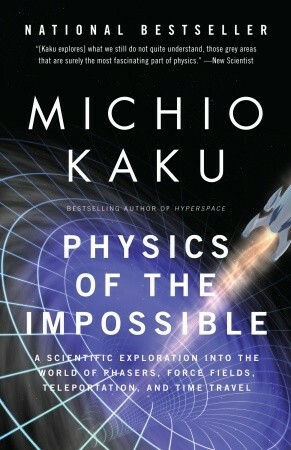 Physics of the Impossible by Michio Kaku. Doubleday; 2008. 329 pages. Paperback/Softcover. Have you ever been watching or reading a science fiction movie or book and wondered if that crazy gadget or idea could actually happen? Do you want an invisibility like Harry Potter? Do you want to fly into the future with Marty McFly? Michio Kaku will discuss whether or not this is a real possibility in the future. The purpose of this book is basically to go over the biggest ideas of science fiction, such as invisibility, force fields, starships, fourth dimensions, etc., and discuss the plausibility of each one in real, scientific terms. I definitely think you might be surprised at some of the results. Kaku lays out the book in extremely simple terms. There are three main sections of the book: Class I impossibilities, which are impossibilities today, but do not violate any laws of physics and could eventually become possible; Class II Impossibilities, which are still slightly within our realm of understanding, but would not come into existence for millions of years; lastly, there are Class III impossibilities, which violate known laws of physics - if they ever become possible, things in our world are even less than what we think. Within each category, Kaku touches upon a plethora of ideas created from the works and worlds of science fiction. What I really loved about this book was Kaku's writing itself. He writes about things that would normally probably bore me to tears, but because of his personality and incredibly smooth writing technique I was able to fully understand and enjoy all parts of this book. Kaku also retains a good sense of objectivity; he incorporates his own personality and style, but does this in a manner so that he doesn't interject his own opinions on the plausibility or rationality of any specific idea. He keeps his mind wide open to any and all possibilities. Overall, I would definitely recommend this to anyone who enjoys science fiction, science in general, technology and advanced technology, or even if you're just curious about whether or not you could have a cloak like Harry Potter! Physics of the Impossible has received four stars from me because it was immensely fascinating and enjoyable, but not quite up to five stars.